This article is about the city of Richmond. For Richmond County, which is between 43 and 53 miles (69 and 85 km) away and unrelated to the city, see Richmond County, Virginia. Richmond /ˈrɪtʃmənd/ is the capital of the Commonwealth of Virginia, in the United States. Since 1871 it has been an independent city and not part of any county. Richmond is the center of the Richmond Metropolitan Statistical Area (MSA) and the Greater Richmond area. As of the 2010 census, the population was 204,214, in 2013, the population was estimated to be 211,172, with a population of 1,208,101 for the Richmond Metropolitan Area — making it the fourth-most populous city in Virginia. Geographically, Richmond is located at the fall line of the James River, 44 miles (71 km) west of Williamsburg, 66 miles (106 km) east of Charlottesville, and 98 miles (158 km) south of Washington, D.C. Surrounded by Henrico and Chesterfield counties, the city is located at the intersections of Interstate 95 and Interstate 64, and encircled by Interstate 295 and Virginia State Route 288. Major suburbs include Midlothian to the southwest, Glen Allen to the north and west, Short Pump to the west and Mechanicsville to the northeast. Richmond's economy is primarily driven by law, finance, and government, with federal, state, and local governmental agencies, as well as notable legal and banking firms, located in the downtown area. The city is home to both the United States Court of Appeals for the Fourth Circuit, one of 13 United States courts of appeals, and the Federal Reserve Bank of Richmond, one of 12 Federal Reserve Banks. Dominion Resources and MeadWestvaco, Fortune 500 companies, are headquartered in the city, with others in the metropolitan area. Tourism is also important, as many historic sites are in or near the city. Before 1607, the Powhatan tribe had lived in the region with one of their capitals there, known as Powhatan, Shocquohocan, or Shockoe. In 1606, James I granted a royal charter to the Virginia Company of London to settle colonists in North America. After the first permanent English-speaking settlement was established in April 1607, at Jamestown, Captain Christopher Newport led explorers northwest up the James River, and on May 24, 1607, erected a cross on one of the small islands in the middle of the part of the river that runs through today's downtown area. Two attempts at English settlement were subsequently made (in 1609 and 1610), but each was abandoned, as the native inhabitants were not willing to give up their capital without a fight. In the 1610s, colonist John Rolfe began to grow a sweeter variety of tobacco at Henricus, and it became a lucrative commodity in the tidewater region, driving further expansion. In 1645, Fort Charles was erected at the falls of the James – the highest navigable point of the James River – as a frontier defense. New settlers moved in, and the community grew into a bustling trading post for furs, hides, and tobacco. In 1737, planter William Byrd II commissioned Major William Mayo to lay out the original town grid. Byrd named the city "Richmond" after the English town of Richmond near (and now part of) London, because the view of the James River was strikingly similar to the view of the River Thames from Richmond Hill in England, where he had spent time during his youth. The settlement was laid out in April 1737, and was incorporated as a town in 1742. Early trade grew rapidly, primarily in the agriculture sector, but also in the slave trade. People were imported from Africa to Richmond's Manchester docks, and were bought and sold as slaves at the same market. Patrick Henry delivered his, "Liberty or Death", speech at St. John's Church in Richmond, helping to ignite the American Revolution. In 1775, Patrick Henry delivered his famous, "Give me Liberty or Give me Death", speech in St. John's Church in Richmond, crucial for deciding Virginia's participation in the First Continental Congress and setting the course for revolution and independence. On April 18, 1780, the state capital was moved from the colonial capital of Williamsburg to Richmond, to provide a more centralized location for Virginia's increasing westerly population, as well as to isolate the capital from British attack. The latter motive proved to be in vain, and in 1781, under the command of Benedict Arnold, Richmond was burned by British troops, causing Governor Thomas Jefferson to flee as the Virginia militia, led by Sampson Mathews, defended the city. Richmond recovered quickly from the war, and by 1782 was once again a thriving city. In 1786, the Virginia Statute for Religious Freedom (drafted by Thomas Jefferson) was passed at the temporary capitol in Richmond, providing the basis for the separation of church and state, a key element in the development of the freedom of religion in the United States. A permanent home for the new government, the Virginia State Capitol building, was designed by Thomas Jefferson with the assistance of Charles-Louis Clérisseau, and was completed in 1788. After the American Revolutionary War, Richmond emerged as an important industrial center. To facilitate the transfer of cargo from the flat-bottomed bateaux above the fall line to the ocean-faring ships below, George Washington helped design the James River and Kanawha Canal in the 18th century to bypass Richmond's rapids, with the intent of providing a water route across the Appalachians to the Kanawha River. The legacy of the canal boatmen is represented by the figure in the center of the city flag. As a result of this and ample access to hydropower due to the falls, Richmond became home to some of the largest manufacturing facilities in the country, including iron works and flour mills, the largest facilities of their kind in the South. The resistance to the slave trade was growing by the mid-nineteenth century; in one famous case in 1848, Henry "Box" Brown made history by having himself nailed into a small box and shipped from Richmond to abolitionists in Philadelphia, Pennsylvania, escaping slavery. Damage to Richmond, Virginia at the close of the American Civil War. Albumen print, 1865. Following the attack on Fort Sumter on April 12, 1861, on April 17, Virginia voted to secede from the United States and joined the Confederate States (though not officially doing so until May), and soon thereafter the Confederate government moved its capital from Montgomery, Alabama to Richmond. The strategic location of the Tredegar Iron Works was one of the primary factors in the decision to make Richmond the Capital of the Confederacy. From this arsenal came the 723 tons of armor plating that covered the CSS Virginia, the world's first ironclad used in war, as well as much of the Confederates' heavy ordnance machinery. The Confederate Congress shared quarters with the Virginia General Assembly in the Virginia State Capitol, with the Confederacy's executive mansion, the "White House of the Confederacy", located two blocks away. The Seven Days Battles followed in late June and early July 1862, during which Union General McClellan threatened to take Richmond but ultimately failed. Three years later, on April 2, 1865, the Union Army under Ulysses S. Grant captured Richmond. About 25% of the city's buildings were destroyed in a fire set by retreating Confederate soldiers, with Union soldiers putting out the fires as they entered the city. Richmond emerged from the smoldering rubble of the Civil War as an economic powerhouse, with iron front buildings and massive brick factories. Canal traffic peaked in the 1860s and slowly gave way to railroads, allowing Richmond to become a major railroad crossroads, eventually including the site of the world's first triple railroad crossing. Tobacco warehousing and processing continued to play a role, boosted by the world's first cigarette-rolling machine, invented by James Albert Bonsack of Roanoke in 1880/81. Contributing to Richmond's resurgence was the first successful electrically powered trolley system in the United States, the Richmond Union Passenger Railway. Designed by electric power pioneer Frank J. Sprague, the trolley system opened its first line in 1888, and electric streetcar lines rapidly spread to other cities across the country. Sprague's system used an overhead wire and trolley pole to collect current, with electric motors on the car's trucks. By the early 20th century, Richmond had an extensive network of electric streetcars, as shown here crossing the Mayo Bridge across the James River, ca. 1917. By the beginning of the 20th century, the city's population had reached 85,050 in 5 square miles (13 km2), making it the most densely populated city in the Southern United States. In 1900, the Census Bureau reported Richmond's population as 62.1% white and 37.9% black. Freed slaves and their descendants created a thriving African-American business community, and the city's historic Jackson Ward became known as the "Wall Street of Black America." In 1903, African-American businesswoman and financier Maggie L. Walker chartered St. Luke Penny Savings Bank, and served as its first president, as well as the first female bank president in the United States. Today, the bank is called the Consolidated Bank and Trust Company, and it is the oldest surviving African-American bank in the U.S. Other figures from this time included John Mitchell, Jr. In 1910, the former city of Manchester was consolidated with the city of Richmond, and in 1914, the city annexed Barton Heights, Ginter Park, and Highland Park areas of Henrico County. In May 1914, Richmond became the headquarters of the Fifth District of the Federal Reserve Bank. Between 1963 and 1965, there was a "downtown boom" that led to the construction of more than 700 buildings in the city. In 1968, Virginia Commonwealth University was created by the merger of the Medical College of Virginia with the Richmond Professional Institute. In 1970, Richmond's borders expanded by an additional 27 square miles (70 km2) on the south. After several years of court cases in which Chesterfield County fought annexation, more than 47,000 people who once were Chesterfield County residents found themselves within the city's perimeters on January 1, 1970. In 1996, still-sore tensions arose amid controversy involved in placing a statue of African American Richmond native and tennis star Arthur Ashe to the famed series of statues of Confederate heroes of the Civil War on Monument Avenue. After several months of controversy, the bronze statue of Ashe was finally completed on Monument Avenue facing the opposite direction from the Confederate Heroes on July 10, 1996. A multi-million dollar flood wall was completed in 1995, in order to protect low-lying areas of city from the oft-rising waters of the James River. As a result the River District businesses grew rapidly, and today the area is home to much of Richmond's entertainment, dining and nightlife activity, bolstered by the creation of a Canal Walk along the city's former industrial canals. Richmond is located at 37°32′N 77°28′W﻿ / ﻿37.533, -77.467 (37.538, −77.462). According to the United States Census Bureau, the city has a total area of 62 square miles (160 km2), of which 60 square miles (160 km2) is land and 2.7 square miles (7.0 km2) of it (4.3%) is water. The city is located in the Piedmont region of Virginia, at the highest navigable point of the James River. The Piedmont region is characterized by relatively low, rolling hills, and lies between the low, sea level Tidewater region and the Blue Ridge Mountains. Significant bodies of water in the region include the James River, the Appomattox River, and the Chickahominy River. The Richmond-Petersburg Metropolitan Statistical Area (MSA), the 44th largest in the United States, includes the independent cities of Richmond, Colonial Heights, Hopewell, and Petersburg, as well as the counties of Charles City, Chesterfield, Dinwiddie, Goochland, Hanover, Henrico, New Kent, Powhatan, and Prince George. As of July 1, 2009 (2009-07-01), the total population of the Richmond—Petersburg MSA was 1,258,251. Richmond's Northside is home to numerous listed historic districts. Neighborhoods such as Chestnut Hill-Plateau and Barton Heights began to develop at the end of the 19th century when the new streetcar system made it possible for people to live on the outskirts of town and still commute to jobs downtown. Other prominent Northside neighborhoods include Azalea, Bellevue, Chamberlayne, Ginter Park, Highland Park, and Rosedale. Further to the west is the affluent, suburban West End. The West End also includes middle to lower income neighborhoods, such as Dumbarton and Lakeside, which can be found directly north of the city, Laurel, Farmington and the areas surrounding the Regency Mall. More affluent areas include Glen Allen, Tuckahoe, and Short Pump, which can all be found north and northwest of the city. The University of Richmond and the Country Club of Virginia can be found here as well, which are located just inside the City Limits. The portion of the city south of the James River is known as the Southside. Neighborhoods in the city's Southside area range from affluent and middle class suburban neighborhoods like Westover Hills, Forest Hill, Southampton, Stratford Hills, Oxford, Huguenot Hills, Hobby Hill, and Woodland Heights to the impoverished Manchester and Blackwell areas, the Hillside Court housing projects, and the ailing Jefferson Davis Highway commercial corridor. Other Southside neighborhoods include Fawnbrook, Broad Rock, Cherry Gardens, Cullenwood, and Beaufont Hills. Much of Southside developed a suburban character as part of Chesterfield County before being annexed by Richmond, most notably in 1970. Richmond has a humid subtropical climate (Köppen Cfa) typical of the American South, with hot and humid summers and generally mild winters. The mountains to the west act as a partial barrier to outbreaks of cold, continental air in winter; Arctic air is delayed long enough to be modified, then further warmed as it subsides in its approach to Richmond. The open waters of the Chesapeake Bay and Atlantic Ocean contribute to the humid summers and mild winters. The coldest weather normally occurs from late December to early February, and the January daily mean temperature is 37.9 °F (3.3 °C), with highs failing to breach the freezing mark on an average 6 days. Downtown areas straddle the border between USDA Hardiness zones 7B and 8A, and temperatures seldom lower to 0 °F (−18 °C), with the most recent subzero (°F) reading occurring on January 28, 2000, when the temperature reached −1 °F (−18 °C). The July daily mean temperature is 79.3 °F (26.3 °C), and high temperatures reach or exceed 90 °F (32 °C) approximately 43 days out of the year; while 100 °F (38 °C) temperatures are not uncommon, they do not occur every year. Extremes in temperature have ranged from −12 °F (−24 °C) on January 19, 1940 up to 107 °F (42 °C) on August 6, 1918. Annual records from the airport weather station that date back to 1948 are available on the web. Precipitation is rather uniformly distributed throughout the year. However, dry periods lasting several weeks do occur, especially in autumn when long periods of pleasant, mild weather are most common. There is considerable variability in total monthly amounts from year to year so that no one month can be depended upon to be normal. Snow has been recorded during seven of the twelve months. Falls of 3 inches (7.6 cm) or more within 24 hours occur an average once per year. Annual snowfall, however, is usually light, averaging 10.5 inches (27 cm) per season. Snow typically remains on the ground only one or two days at a time, but remained for 16 days in 2010 (January 30 to February 14). Ice storms (freezing rain or glaze) are not uncommon, but they are seldom severe enough to do any considerable damage. Based on the 1981–2010 period, the average first occurrence of at or below freezing temperatures in the fall is November 4 and the average last occurrence in the spring is April 5. As of the 2010 United States Census, there were 204,214 people residing in the city. 50.6% were Black or African American, 40.8% White, 2.3% Asian, 0.3% Native American, 0.1% Pacific Islander, 3.6% of some other race and 2.3% of two or more races. 6.3% were Hispanic or Latino (of any race). As of the 2005–2007 American Community Survey conducted by the U.S. Census Bureau, White Americans made up 41.6% of Richmond's population (39.5% non-Hispanic whites), Blacks or African Americans made up 52.3% of Richmond's population (52.1% non-Hispanic blacks). American Indians made up 0.4% of the city's population; of which 75% were non-Hispanic. Asian Americans made up 1.6% of the city's population. Pacific Islander Americans made up less than 0.1% of the city's population. Individuals from some other race made up 1.7% of the city's population; of which 0.2% were non-Hispanic. Individuals from two or more races made up 2.4% of the city's population; of which 2.1% were non-Hispanic. In addition, Hispanics and Latinos made up 4.2% of Richmond's population. Non-Hispanic Whites were 39.1% of the population in 2010, compared to 57.0% in 1970. As of the census of 2000, there were 197,790 people, 84,549 households, and 43,627 families residing in the city. The population density was 3,292.6 people per square mile (1,271.3/km²). There were 92,282 housing units at an average density of 1,536.2 per square mile (593.1/km²). The racial makeup of the city was 38.3% White, 57.2% African American, 0.2% Native American, 1.3% Asian, 0.1% Pacific Islander, 1.5% from other races, and 1.5% from two or more races. Hispanic or Latino of any race were 2.6% of the population. In the city the age distribution of the population shows 21.8% under the age of 18, 13.1% from 18 to 24, 31.7% from 25 to 44, 20.1% from 45 to 64, and 13.2% who were 65 years of age or older. The median age was 34 years. For every 100 females there were 87.1 males. For every 100 females age 18 and over, there were 83.5 males. In 2004, Morgan Quitno Press ranked Richmond as the ninth (out of 354) most dangerous city in the United States. In 2005, Richmond was ranked as the fifth most dangerous city overall and the 12th most dangerous metropolitan area in the United States. The following year, Richmond saw a decline in crime, ranking as the 15th most dangerous city in the United States. By 2008, Richmond's position on the list had fallen to 49th. Richmond has several historic churches. Because of its early English colonial history from the early 17th century to 1776, Richmond has a number of prominent Anglican/Episcopal churches including Monumental Church, St. Paul's Episcopal Church and St. John's Episcopal Church. Methodists and Baptists made up another section of early churches, and First Baptist Church of Richmond was the first of these, established in 1780. In the Reformed church tradition, the first Presbyterian Church in the City of Richmond was First Presbyterian Church, organized on June 18, 1812. On February 5, 1845, Second Presbyterian Church of Richmond was founded, which was a historic church where Stonewall Jackson attended and was the first Gothic building and the first gas-lit church to be built in Richmond. St. Peter's Church was dedicated and became the first Catholic church in Richmond on May 25, 1834. The city is also home to the historic Cathedral of the Sacred Heart which is the motherchurch for the Roman Catholic Diocese of Richmond. The first Jewish congregation in Richmond was Kahal Kadosh Beth Shalom. Kahal Kadosh Beth Shalom was the sixth congregation in the United States. By 1822 K.K. Beth Shalom members worshipped in the first synagogue building in Virginia. They eventually merged with Congregation Beth Ahabah, an offshoot of Beth Shalom. There are two Orthodox Synagogues, Keneseth Beth Israel and Chabad of Virginia. There is an Orthodox Yeshivah K–12 school system known as Rudlin Torah academy, which also includes a post high-school program. There are two Conservative synagogues, Beth El and Or Atid. There are two Reform synagogues, Beth Ahabah and Or Ami. Along with such religious congregations, there are a variety of other Jewish charitable, educational and social service institutions, each serving the Jewish and general communities. These include the Weinstein Jewish Community Center, Jewish Family Services, Jewish Community Federation of Richmond and Richmond Jewish Foundation. There are seven current masjids in the Greater Richmond area, with three more currently in construction, accommodating the growing Muslim population. The first one being Masjid Bilal. In the 1950s, Muslims from the East End got organized under Nation of Islam (NOI). They used to meet in Temple #24 located on North Avenue. After the NOI split in 1975, the Muslims who joined mainstream Islam, start meeting at Shabaaz Restaurant on Nine Mile Road. By 1976, the Muslims used to meet in a rented church. They tried to buy this church, but due to financial difficulties the Muslims instead bought an old grocery store at Chimbarazoo Boulevard, the present location of Masjid Bilal. Initially, the place was called “Masjid Muhammad #24.” Only by 1990 did the Muslims renamed it to “Masjid Bilal”. Masjid Bilal was followed by the Islamic Center of Virginia, ICVA masjid. The ICVA was established in 1973 as a non profit tax exempt organization. With aggressive fundraising, ICVA was able to buy land on Buford road. Construction of the new masjid began in the early 1980s. The rest of the five current masjids in the Richmond area are Islamic Center of Richmond (ICR) in the west end, Masjid Umm Barakah on 2nd street downtown, Islamic Society of Greater Richmond (ISGR) in the west end, Masjidullah in the north side, and Masjid Ar-Rahman in the east end. Hinduism is very large as well in the area, especially in the suburban areas of Henrico and Chesterfield. Local estimates say that there are approximately 6,000 families of Indian descent residing in the Richmond Region as of 2011. All are served by several temples and cultural centers across the region, the two most familiar being the Cultural Center of India (CCI) located off of Iron Bridge Road in Chesterfield County, and the Hindu Center of Virginia in Henrico County which has garnered national fame and awards for being the first LEED certified religious facility in the state. Both were planned and built by NBJ Architects, a local architecture firm. There are several seminaries in Richmond. These include a theology school at Virginia Union University, a Presbyterian seminary called Union Presbyterian Seminary, and a Baptist seminary known as Baptist Theological Seminary at Richmond. The McCollough Theological Seminary of the United House of Prayer For All People is located in the Church Hill neighborhood of the City. The Roman Catholic Diocese of Richmond was canonically erected by Pope Pius VII on July 11, 1820. Today there are 235,816 Catholics at 146 parishes in the Diocese of Richmond. The city of Richmond is home to 19 Catholic parishes. Cathedral of the Sacred Heart is home to the current bishop Most Reverend Francis Xavier DiLorenzo who was appointed by Pope John Paul II on March 31, 2004. Law and finance have long been driving forces in the economy. The city is home to both the United States Court of Appeals for the Fourth Circuit, one of 13 United States courts of appeals, and the Federal Reserve Bank of Richmond, one of 12 Federal Reserve Banks, as well as offices for international companies such as Genworth Financial, CapitalOne, Philip Morris USA, and numerous other banks and brokerages. Richmond is also home to five of the largest law firms in the United States: Reed Smith, Hunton & Williams, McGuireWoods, Williams Mullen, and LeClairRyan. Another law firm with a major Richmond presence is Troutman Sanders, which merged with Richmond-based Mays & Valentine LLP in 2001. Since the 1960s Richmond has been a prominent hub for advertising agencies and advertising related businesses, including The Martin Agency, named 2009 U.S. Agency of the Year by AdWeek. As a result of local advertising agency support, VCU's graduate advertising school (VCU Brandcenter) is consistently ranked the No. 1 advertising graduate program in the country. Six Fortune 500 companies are headquartered in the Richmond area. The Greater Richmond area was named the third-best city for business by MarketWatch in September 2007, ranking behind only the Minneapolis and Denver areas and just above Boston. The area is home to six Fortune 500 companies: electric utility Dominion Resources; CarMax; Owens & Minor; Genworth Financial; MeadWestvaco; and Altria Group. However, only Dominion Resources and MeadWestvaco are headquartered within the city of Richmond; the others are located in the neighboring counties of Henrico and Hanover. In 2008, Altria moved its corporate HQ from New York City to Richmond, adding another Fortune 500 corporation to Richmond's list. In February 2006, MeadWestvaco announced that they would move from Stamford, Connecticut, to Richmond in 2008 with the help of the Greater Richmond Partnership, a regional economic development organization that also helped locate Aditya Birla Minacs, Amazon.com, and Honeywell International, to the region. Other Fortune 500 companies, while not headquartered in the area, do have a major presence. These include SunTrust Bank (based in Atlanta), Capital One Financial Corporation (officially based in McLean, Virginia, but founded in Richmond with its operations center and most employees in the Richmond area), and the medical and pharmaceutical giant McKesson (based in San Francisco). Capital One and Altria company's Philip Morris USA are two of the largest private Richmond-area employers. DuPont maintains a production facility in South Richmond known as the Spruance Plant. UPS Freight, the less-than-truckload division of UPS and formerly known as Overnite Transportation, has its corporate headquarters in Richmond. Richmond is also home to the Southern States Cooperative, one of the largest farm supply cooperatives in the US. As a result of its leadership role in agriculture, Southern States has continued to expand and today encompasses some 1,200 retail locations in 23 states. Owned by more than 300,000 farmers since 1923, the cooperative purchases, manufactures or processes feed, seed, fertilizer, farm supplies and fuel. Other companies based in Richmond include chemical company NewMarket; Universal Corporation, a tobacco merchant; Cavalier Telephone, now Windstream, a telephone, internet, and digital television provider formed in Richmond in 1998; and Cherry Bekaert & Holland, a top 30 accounting firm serving the Southeast. Richmond was the home of the Ukrop's Super Market, a regional, family-owned chain of supermarkets known for its customer service and innovation. Ukrop's was a high-profile sponsor of community events, such as the Monument Avenue 10K, Easter on Parade, and the Ukrop's Christmas Parade. However, the chain announced that it would be sold to Giant Food Stores, a subsidiary of Dutch conglomerate Ahold, in February 2010. The stores now operate under the brand "Martin's" though they continue to sell Ukrop's bakery and prepared food items. As the primary former Capital of the Confederate States of America, Richmond is home to many museums and battlefields of the American Civil War. Near the riverfront is the Richmond National Battlefield Park Visitors Center and the American Civil War Center at Historic Tredegar, both housed in the former buildings of the Tredegar Iron Works, where much of the ordnance for the war was produced. In Court End, near the Virginia State Capitol, is the Museum of the Confederacy, along with the Davis Mansion, also known as the White House of the Confederacy; both feature a wide variety of objects and material from the era. The temporary home of former Confederate General Robert E. Lee still stands on Franklin Street in downtown Richmond. The history of slavery and emancipation are also increasingly represented: there is a former slave trail along the river that leads to Ancarrow's Boat Ramp and Historic Site which has been developed with interpretive signage, and in 2007, the Reconciliation Statue was placed in Shockoe Bottom, with parallel statues placed in Liverpool and Benin representing points of the Triangle Trade. Other historical points of interest include St. John's Church, the site of Patrick Henry's famous "Give me liberty or give me death" speech, and the Edgar Allan Poe Museum, features many of his writings and other artifacts of his life, particularly when he lived in the city as a child, a student, and a successful writer. The John Marshall House, the home of the former Chief Justice of the United States, is also located downtown and features many of his writings and objects from his life. Hollywood Cemetery is the burial grounds of two U.S. Presidents as well as many Civil War officers and soldiers. The city is home to many monuments and memorials, most notably those along Monument Avenue. Other monuments include the A.P. Hill monument, the Bill "Bojangles" Robinson monument in Jackson Ward, the Christopher Columbus monument near Byrd Park, and the Confederate Soldiers and Sailors Monument on Libby Hill. Located near Byrd Park is the famous World War I Memorial Carillon, a 56-bell carillon tower. Dedicated in 1956, the Virginia War Memorial is located on Belvedere overlooking the river, and is a monument to Virginians who died in battle in World War II, the Korean War, the Vietnam War, the Gulf War, the War in Afghanistan, and the Iraq War. As of 2012 a variety of murals from internationally recognized street artists have appeared throughout the city as a result of The Richmond Mural Project and the RVA Street Art Festival. Artists who have produced work in the city as a result of these festivals include ROA, Pixel Pancho, Gaia, Aryz, Alexis Diaz, Ever Siempre, Jaz, 2501, Natalia Rak, Pose MSK, Vizie, Jeff Soto, Mark Jenkins, Etam Cru- and local artists Hamilton Glass, Nils Westergard, and El Kamino. Both festivals are expected to continue this year with artists such as Ron English slated to produce work. From earliest days, Virginia, and Richmond in particular, have welcomed live theatrical performances. From Lewis Hallam's early productions of Shakespeare in Williamsburg, the focus shifted to Richmond's antebellum prominence as a main colonial and early 19th century performance venue for such celebrated American and English actors as William Macready, Edwin Forrest, and the Booth family. In the 20th century, Richmonders' love of theater continued with many amateur troupes and regular touring professional productions. In the 1960s a small renaissance or golden age accompanied the growth of professional dinner theaters and the fostering of theater by the Virginia Museum, reaching a peak in the 1970s with the establishment of a resident Equity company at the Virginia Museum Theater (now the Leslie Cheek) and the birth of Theatre IV, a company that continues to this day. Barksdale Theatre, Central Virginia's first nonprofit professional performing arts organization, founded in 1953 at the historic Hanover Tavern. When they began serving meals to lure Richmond residents out to Hanover, they created the nation's first dinner theater. Barksdale also became the first performing arts organization in Virginia to open its doors to an integrated audience. Today, Barksdale is recognized as Central Virginia's leading professional theater, with two home locations: Barksdale Theatre at Hanover Tavern (with a four-play Country Playhouse Season) and Barksdale Theatre at Willow Lawn (with a five-play Signature Season). Theatre IV, the Children's Theatre of Virginia, which was founded in 1975 by Bruce Miller and Phil Whiteway (who continue to hold the positions of Artistic and Managing Directors). Theatre IV is one of the largest theaters in Virginia and the second largest children's theater in the nation, touring regularly throughout 32 states plus the District of Columbia. Empire Theater In 1986, Theatre IV purchased the historic Empire Theater in downtown Richmond, previously occupied by Keith Fowler's artistically adventurous but short-lived LORT troupe, the American Revels Company; Theatre IV asserted sound financial strategies and began a Family Playhouse series of mainstage (non-touring) productions. In 2001, Theatre IV assumed management of Barksdale Theatre. The two nonprofit companies maintain independent missions, boards, budgets, audits and assets, while sharing a common professional staff. The Landmark Theatre, the city-owned opera house. The Leslie Cheek Theater, after lying dormant for eight years, re-opened in 2011 in the heart of the Virginia Museum of Fine Arts at 200 N. Boulevard. The elegant 500-seat proscenium stage was constructed in 1955 to match then museum director Leslie Cheek's vision of a theater worthy of a fine arts institution. Operating for years as the Virginia Museum Theater (VMT), it supported an amateur community theater under the direction of Robert Telford. When Cheek retired, he advised trustees on the 1969 appointment of Keith Fowler as head of the theater arts division and artistic director of VMT. Fowler led the theater to become the city's first resident Actors Equity\LORT theater, adding major foreign authors and the premieres of new American works to the repertory. Under his leadership VMT reached a "golden age," gaining international recognition and more than doubling its subscription base. Successive artistic directors changed the name of the theater to "TheatreVirginia." Deficits caused TheatreVirginia to close its doors in 2002. Now, renovated and renamed for its founder, the Leslie Cheek is restoring live performance to VMFA and, while no longer supporting a resident company, it is available for special theatrical and performance events. SPARC (School of the Performing Arts in the Richmond Community). SPARC was founded in 1981, and trained children to become "triple threats", meaning they were equally versed in singing, acting, and dancing. SPARC has become the largest community-based theater arts education program in Virginia and it offers classes to every age group, during the summer and throughout the year. Richmond Triangle Theater presents works of interest to the local gay and lesbian community. In addition, in 2008, a new 47,000-square-foot (4,400 m2) Gay Community Center opened on the city's north side, which hosts meetings of many kinds, and includes a large art gallery space. Commercial art galleries include Metro Space Gallery and Gallery 5 in a newly designated arts district. Not-for-profit galleries include Visual Arts Center of Richmond and 1708 Gallery. Thomas Jefferson designed the Virginia State Capitol in Richmond. 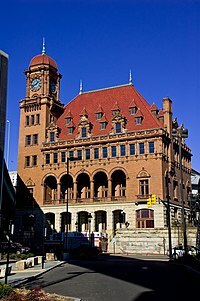 The Science Museum of Virginia, housed in Broad Street Station, designed by John Russell Pope. The firm of John Russell Pope designed Broad Street Station as well as Branch House on Monument Avenue, designed as a private residence in the Tudor style, now serving as the Virginia Center for Architecture. Broad Street Station (or Union Station), designed in the Beaux-Arts style, is no longer a functioning station but is now home to the Science Museum of Virginia. Main Street Station, designed by Wilson, Harris, and Richards, has been returned to use in its original purpose. The Jefferson Hotel and the Commonwealth Club were both designed by the classically trained Beaux-Arts architects Carrère and Hastings. Many buildings on the University of Richmond campus, including Jeter Hall and Ryland Hall, were designed by Ralph Adams Cram, most famous for his Princeton University Chapel and the Cathedral of Saint John the Divine. Richmond is home to several notable instances of various styles of modernism. Minoru Yamasaki designed the Federal Reserve Building which dominates the downtown skyline. The architectural firm of Skidmore, Owings & Merrill has designed two buildings: the Library of Virginia and the General Assembly Offices at the Eighth and Main Building. Philip Johnson designed the WRVA Building. The Richard Neutra-designed Rice House, a residence on a private island on the James River, remains Richmond's only true International Style home. The W.G. Harris residence in Richmond was designed by famed early modern architect and member of the Harvard Five, Landis Gores. Other notable architects to have worked in the city include Rick Mather, I.M. Pei, and Gordon Bunshaft. VCU is currently raising funds for a new Institute of Contemporary Arts designed by Steven Holl. The ICA is to be funded by private donors and will hopefully be opened by 2015. The city operates one of the oldest municipal park systems in the country. The park system began when the city council voted in 1851 to acquire 7.5 acres (30,400 m2), now known as Monroe Park. Today, Monroe Park sits adjacent to the Virginia Commonwealth University campus and is one of more than 40 parks comprising a total of more than 1,500 acres (610 ha). Two other major parks in the city along the river are Byrd Park and Maymont, located near the fan district. Byrd Park features a one mile (1.6 km) running track, with exercise stops, a public dog park, and a number of small lakes for small boats, as well as two monuments, Buddha house, and an amphitheatre. Prominently featured in the park is the World War I Memorial Carillon, built in 1926 as a memorial to those that died in the war. Maymont, located adjacent to Byrd Park, is a 100-acre (40 ha) Victorian estate with a museum, formal gardens, native wildlife exhibits, nature center, carriage collection, and children's farm. Other parks in the city include Joseph Bryan Park Azalea Garden, Forest Hill Park (former site of the Forest Hill Amusement Park), Chimborazo Park (site of the National Battlefield Headquarters), among others. Richmond does not host regular season games for any major league professional sports teams, however, starting in 2013, the Washington Redskins of the National Football League will conduct their summer training camp in Richmond. There are also several minor league sports in the city, including the Richmond Kickers of the USL Professional Division (third tier of American soccer) and the Richmond Flying Squirrels of the Class AA Eastern League of Minor League Baseball (an affiliate of the San Francisco Giants). The Kickers began playing in Richmond in 1993, and currently play at City Stadium. The Squirrels opened their first season at The Diamond on April 15, 2010. From 1966 through 2008, Richmond hosted the Richmond Braves, a AAA affiliate of the Atlanta Braves of Major League Baseball, until they were moved to Gwinnett County, Georgia. The city also has hosted the Richmond Raiders of the Professional Indoor Football League since 2010, who play at the Richmond Coliseum downtown. The Coliseum is a 13,000-plus seat multi-purpose arena which also hosts a large number of sporting events, concerts, festivals, and trade shows. The venue also hosted the Richmond Renegades of the East Coast Hockey League from 1990 − 2003. The team attempted to revive again as a Southern Professional Hockey League franchise from 2006 − 2009. The VCU Rams men's and women's basketball teams (Atlantic 10 Conference) also played at the Coliseum until completion of the Stuart C. Siegel Center in 1999. Richmond is also home to the 6,000-seat Arthur Ashe Athletic Center, another multi-purpose arena named for tennis great and Richmond resident Arthur Ashe. This facility also hosts a variety of local sporting events, concerts, and other activities. The site also briefly hosted the Richmond Revolution of the Indoor Football League (not to be confused with Richmond Raiders) in 2010 and 2011. As the home of Arthur Ashe, the sport of tennis is also popular in Richmond, and in 2010, the United States Tennis Association named Richmond as the third "Best Tennis Town", behind Charleston, South Carolina, and Atlanta, Georgia. Auto racing is also very popular in the area. The Richmond International Raceway (RIR) has hosted NASCAR Sprint Cup races since 1953, as well as the Capital City 400 from 1962 − 1980. RIR also hosted IndyCar's Suntrust Indy Challenge from 2001 − 2009. Another track, Southside Speedway, has operated since 1959 and sits just southwest of Richmond in Chesterfield County. This .333-mile (0.536 km) oval short-track has become known as the "Toughest Track in the South", and features weekly stock car racing on Friday nights. Southside Speedway has acted as the breeding grounds for many past NASCAR legends including Richard Petty, Bobby Allison and Darrell Waltrip, and claims to be the home track of NASCAR superstar Denny Hamlin. Richmond has played host to the Xterra (off-road triathlon) East Championship since 1998 on the trails of the James River Park, and will host the 2015 UCI Road World Championships. The Richmond Times-Dispatch, the local daily newspaper in Richmond with a Sunday circulation of 215,000, is owned by BH Media, a subsidiary of Warren Buffett's Berkshire Hathaway company. Style Weekly is a standard weekly publication covering popular culture, arts, and entertainment, owned by Landmark Communications. RVA Magazine is the city's only independent art music and culture publication, was once monthly, but is now issued quarterly. The Richmond Free Press and the Voice cover the news from an African-American perspective. The Richmond metro area is served by many local television and radio stations. As of 2010, the Richmond-Petersburg designated market area (DMA) is the 58th largest in the U.S. with 553,950 homes according to Nielsen Market Research. The major network television affiliates are WTVR-TV 6 (CBS), WRIC-TV 8 (ABC), WWBT 12 (NBC), WRLH-TV 35 (Fox), and WUPV 65 (CW). Public Broadcasting Service stations include WCVE-TV 23 and WCVW 57. There are also a wide variety of radio stations in the Richmond area, catering to many different interests, including news, talk radio, and sports, as well as an eclectic mix of musical interests. Many films and television shows have been filmed, in whole or in part, in Richmond, including "Killing Kennedy", "Lincoln",The Box, Finnegan Begin Again, Hannibal, The Jackal, Hearts in Atlantis, The Contender, Shadow Conspiracy, Evan Almighty, and Iron Jawed Angels. Locations featured in the 1990s television cartoon, "Doug", are named after or inspired by areas in Richmond and nearby counties as creator Jim Jinkins was born and raised in Richmond. Richmond's elite society has also been portrayed in various popular culture references, such as in 1920s novels by Ellen Glasgow and James Branch Cabell, or the 1990s television sitcom A Different World, which featured the character Whitley Gilbert, an obnoxious and wealthy African American debutante. The 2009 TNT television drama HawthoRNe, starring Jada Pinkett Smith and Michael Vartan, is set at the fictitious Richmond-Trinity Hospital which is based on Richmond's Community Hospital in Church Hill. Richmond has originated and been home to many musicians, including GWAR, D'Angelo, Lamb of God, Avail, Fighting Gravity, Municipal Waste, Pat Benatar and Carbon Leaf. In 1977, a federal district court ruled in favor of Curtis Holt Jr. who had claimed the councils existing election process — an at large voting system — was racially biased. The verdict required the city to rebuild its council into 9 distinct wards. Within the year the city council switched from majority white to majority black, reflecting the city's populace. This new city council elected Richmond's first black mayor, Henry L. Marsh. In 1990 religion and politics intersected to impact the outcome of the Eighth District election in South Richmond. With the endorsements of black power brokers, black clergy and the Richmond Crusade for Voters, South Richmond residents made history, electing Reverend A. Carl Prince to the Richmond City Council. As the first African American Baptist Minister elected to the Richmond City Council, Prince's election paved the way for a political paradigm shift in politics that persist today. Following Prince's election, Reverend Gwendolyn Hedgepeth and the Reverend Leonidas Young, former Richmond Mayor were elected to public office. Prior to Prince's election black clergy made political endorsements and served as appointees to the Richmond School Board and other boards throughout the city. Today religion and politics continues to thrive in the Commonwealth of Virginia. The Honorable Dwight C. Jones, a prominent Baptist pastor and former Chairman of the Richmond School Board and Member of the Virginia House of Delegates serves as Mayor of the City of Richmond. Richmond's government changed in 2004 from a council-manager form of government to an at-large, popularly elected Mayor. In a landslide election, incumbent mayor Rudy McCollum was defeated by L. Douglas Wilder, who previously served Virginia as the first elected African American governor in the United States since Reconstruction. The current mayor of Richmond is Dwight Clinton Jones. The mayor is not a part of the Richmond City Council. As of March 2009, the Richmond City Council consisted of: Kathy C. Graziano, 4th District, President of Council; Ellen F. Robertson, 6th District, Vice-President of Council; Bruce Tyler, 1st District; Charles R. Samuels, 2nd District; Chris A. Hilbert, 3rd District; E. Martin (Marty) Jewell, 5th District; Cynthia I Newbille, 7th District; Reva M. Trammell, 8th District; and Douglas G. Conner Jr., 9th District. As of 2008, there were 36 private schools serving grades one or higher in the city of Richmond. Some of these schools include: Benedictine High School., St. Bridget School, Brook Road Academy, Collegiate School, St. Christopher's School, St. Gertrude High School, St. Catherine's School, Southside Baptist Christian School, Northstar Academy, The Steward School, Trinity Episcopal School, and Veritas School. The Richmond area has many major institutions of higher education, including Virginia Commonwealth University (public), University of Richmond (private), Virginia Union University (private), Virginia College (private), Union Theological Seminary & Presbyterian School of Christian Education (private), and the Baptist Theological Seminary in Richmond (BTSR—private). Several community colleges are found in the metro area, including J. Sargeant Reynolds Community College and John Tyler Community College (Chesterfield County). In addition, there are several Technical Colleges in Richmond including ITT Technical Institute, ECPI College of Technology and Beta Tech. There are several vocational colleges also, such as Fortis College and Bryant Stratton College. Virginia State University is located about 20 miles (32 km) south of Richmond, in the suburb of Ettrick, just outside of Petersburg. Randolph-Macon College is located about 15 miles (24 km) north of Richmond, in the incorporated town of Ashland. Richmond is a major hub for intercity bus company Greyhound Lines, with its terminal at 2910 N Boulevard. Multiple runs per day connect directly with Washington, D.C., New York, Raleigh, and elsewhere. Direct trips to New York take approximately 7.5 hours. Discount carrier Megabus also provides curbside service from outside of Main Street Station, with fares starting at $1. Direct service is available to Washington, D.C., Hampton Roads, Charlotte, Raleigh, Baltimore, and Philadelphia. Most other connections to Megabus served cites, such as New York, can be made from Washington, D.C.
Local transit and paratransit bus service in Richmond, Henrico, and Chesterfield counties is provided by the Greater Richmond Transit Company (GRTC). The GRTC, however, serves only small parts of the suburban counties. The far West End (Innsbrook and Short Pump) and almost all of Chesterfield County have no public transportation despite dense housing, retail, and office development. According to a 2008 GRTC operations analysis report, a majority of GRTC riders utilize their services because they do not have an available alternative such as a private vehicle. Electricity in the Richmond Metro area is provided by Dominion Virginia Power. The company, based in Richmond, is one of the nation's largest producers of energy, serving retail energy customers in nine states. Electricity is provided in the Richmond area primarily by the North Anna Nuclear Generating Station and Surry Nuclear Generating Station, as well as a coal-fired station in Chester, Virginia. These three plants provide a total of 4,453 megawatts of power. Several other natural gas plants provide extra power during times of peak demand. These include facilities in Chester, and Surry, and two plants in Richmond (Gravel Neck and Darbytown). ^ PEIFER, KARRI. "A year in dining." Richmond.com December 30, 2010: n. pag. Web. January 1, 2011. .
^ Civil War Richmond – The South’s Capital - Virginia Is For Lovers. Virginia.org (2012-05-18). Retrieved on 2013-08-21. ^ "State & County QuickFacts". United States Census Bureau. http://quickfacts.census.gov/qfd/states/51/51760.html. Retrieved January 6, 2014. ^ a b "Fortune 500 2012: States: Virginia Companies." Fortune Magazine via CNN.com. May 21, 2012. Retrieved on September 13, 2012. ^ a b c "Richmond, Virginia." Encyclopædia Britannica Eleventh Edition. Retrieved on July 9, 2007. ^ a b c "Government & History of Richmond. "City of Richmond. Retrieved on July 9, 2007. ^ "History of Jamestown." APVA Preservation Virginia. Retrieved on January 20, 2010. ^ Peterson, Merrill D.; Vaughan, Robert C. "The Virginia Statute for Religious Freedom: Its Evolution and Consequences in American History." Published 1988, Cambridge University Press. Retrieved on July 11, 2007. ^ "Capital Cities of the Confederacy." Civil War Preservation Trust. Retrieved on July 11, 2007. ^ Gibson, Campbell. "Population of the 100 Largest Cities and Other Urban Places in the United States: 1790 to 1990." United States Census Bureau, June 1998. Retrieved on July 11, 2007. ^ a b "Virginia - Race and Hispanic Origin for Selected Cities and Other Places: Earliest Census to 1990". U.S. Census Bureau. http://www.census.gov/population/www/documentation/twps0076/twps0076.html. ^ Edds, Margaret; Little, Robert. "Why Richmond voted to Honor Arthur Ashe on Monument Avenue. The Final, Compelling Argument for Supporters: A Street Reserved for Confederate Heroes had no Place in this City." The Virginian-Pilot. July 19, 1995. ^ a b c d e "Neighborhood Guide." City of Richmond. Retrieved on July 12, 2007. ^ a b "FAQs & HOLIDAY CLIMATOLOGY RICHMOND." National Oceanic and Atmospheric Administration. 1897-4/10/2010. ^ ". "National Oceanic and Atmospheric Administration." ^ weather-warehouse.com: "Richmond International Airport"
^ "U.S. Decennial Census". United States Census Bureau. http://www.census.gov/prod/www/decennial.html. Retrieved January 2, 2014. ^ "Historical Census Browser". University of Virginia Library. http://mapserver.lib.virginia.edu. Retrieved January 2, 2014. ^ "Population of Counties by Decennial Census: 1900 to 1990". United States Census Bureau. http://www.census.gov/population/cencounts/va190090.txt. Retrieved January 2, 2014. ^ "Census 2000 PHC-T-4. Ranking Tables for Counties: 1990 and 2000". United States Census Bureau. http://www.census.gov/population/www/cen2000/briefs/phc-t4/tables/tab02.pdf. Retrieved January 2, 2014. ^ American FactFinder, United States Census Bureau. "US Census". Factfinder.census.gov. http://factfinder.census.gov/servlet/ADPTable?_bm=y&-geo_id=16000US5167000&-qr_name=ACS_2007_3YR_G00_DP3YR5&-ds_name=ACS_2007_3YR_G00_&-_lang=en&-_sse=on. Retrieved November 1, 2011. 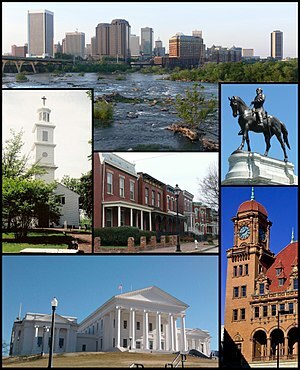 ^ "Richmond (city), Virginia". State & County QuickFacts. U.S. Census Bureau. http://quickfacts.census.gov/qfd/states/51/5167000.html. ^ "Uniform Crime Reports and Index of Crime in Richmond in the State of Virginia enforced by Richmond Polic from 1985 to 2005.". The Disaster Center. http://www.disastercenter.com/virginia/crime/13986.htm. Retrieved July 14, 2012. ^ "Top and Bottom 25 Cities Overall". Morgan Quitno Press. http://www.statestats.com/cit05pop.htm. Retrieved July 14, 2012. ^ "CQpress.com" (PDF). http://cqpress.com/docs/met05r.pdf. Retrieved July 14, 2012. ^ "Infoplease.com". Infoplease.com. http://www.infoplease.com/ipa/A0934323.html. Retrieved November 1, 2011. ^ "Statestats.com". Statestats.com. http://www.statestats.com/cit06pop.htm. Retrieved November 1, 2011. ^ "2008 City Crime Rankings.". CQ Press. http://os.cqpress.com/citycrime/CityCrime2008_Rank_Rev.pdf. Retrieved July 14, 2012. ^ Williams, Reed; Bowes, Mark (January 10, 2010). "Central Va. had 4 fewer homicides last year than in 2008.". Richmond Times Dispatch. http://www2.timesdispatch.com/news/2010/jan/10/homi10_20100109-221204-ar-20533/. Retrieved July 14, 2012. ^ "2010 Crime Rate Indexes for Richmond, Virginia.". CLR Search.. http://www.clrsearch.com/Richmond_Demographics/VA/Crime-Rate. Retrieved July 14, 2012. ^ Williams, Reed (December 7, 2008). "Richmond's homicide rate on pace to reach 37-year low.". Richmond Times Dispatch. http://www2.timesdispatch.com/news/2008/dec/07/rhom07_20081206-211651-ar-102109/. Retrieved July 14, 2012. ^ "St. Peter's' Site". Stpeterchurch1834.org. http://www.stpeterchurch1834.org/our-history.php. Retrieved February 10, 2012. ^ "Cathedral of The Sacred Heart | Catholic Diocese of Richmond". Richmonddiocese.org. http://www.richmonddiocese.org/parish/cathedral-sacred-heart. Retrieved February 10, 2012. ^ "Chabad of the Virginias". Chabad.org. http://www.chabad.org/centers/default_cdo/aid/117734/jewish/Chabad-of-Virginia.htm. Retrieved November 1, 2011. ^ Richmond Greek Festival. Retrieved on January 20, 2010. ^ "Masjid Al-Falah". http://www.salatomatic.com/d/Henrico+22867+Islamic-Center-of-Henrico. Retrieved 29 June 2012. ^ "West End Islamic Center". http://westendislamiccenter.org/index.php. Retrieved 29 June 2012. ^ "Masjid Yusuf". https://www.icrva.org/index.php?option=com_content&view=category&layout=blog&id=40&Itemid=68. Retrieved 29 June 2012. ^ "Masjid Bilal". http://www.masjidbilalva.org/. Retrieved 29 June 2012. ^ "Islamic Center of Virginia". http://ww2.icva1.com/index.php. Retrieved 29 June 2012. ^ "Islamic Center of Richmond". https://www.icrva.org/. Retrieved 29 June 2012. ^ "Masjid Umm Barakah". http://www.masjidummbarakah.com/. Retrieved 29 June 2012. ^ "Islamic Society of Greater Richmond". http://www.isgr.org/. Retrieved 29 June 2012. ^ "Masjidullah". http://www.islamicfinder.org/getitWorld.php?id=10501. Retrieved 29 June 2012. ^ "Masjid Ar-Rahman". http://www.islamicfinder.org/getitWorld.php?id=15539. Retrieved 29 June 2012. ^ "History of the Diocese & Diocesan Statistics | Catholic Diocese of Richmond". Richmonddiocese.org. http://www.richmonddiocese.org/node/12. Retrieved February 10, 2012. ^ Parish Search School Search. "Parish Locator | Catholic Diocese of Richmond". Richmonddiocese.org. http://www.richmonddiocese.org/cdr/parish/search?name=&service_time=&service_type=&service_lang=&lpa=&city=richmond&zip=&radius=10&op=Submit&form_build_id=form-6c5f607b599fd7aaba3796b9c8668093&form_id=parish_search_form. Retrieved February 10, 2012. ^ The Top 5. Creativity. March 2005. ^ "Richmond Center Stage". Richmond Center Stage. http://www.richmondcenterstage.com/. Retrieved November 1, 2011. ^ "City's bid for corporate HQ lost in traffic". Atlanta Business Chronicle. http://www.bizjournals.com/atlanta/stories/2007/03/19/story2.html?page=all. Retrieved 16 July 2013. ^ "Minacs to Hire 250+ in Richmond, VA: Invites Applications". Yahoo Finance. March 20, 2013. http://finance.yahoo.com/news/minacs-hire-250-richmond-va-130000178.html. Retrieved 15 July 2013. ^ "Amazon.com to open two fulfillment centers in Va.". Retailing Today. http://retailingtoday.com/article/amazoncom-open-two-fulfillment-centers-va. Retrieved 16 July 2013. ^ "Honeywell Expands Advanced Fiber Production in Virginia - See more at: http://businessfacilities.com/honeywell-expands-advanced-fiber-production-in-virginia/#sthash.VUM7K9Mx.dpuf". Business Facilities. http://businessfacilities.com/honeywell-expands-advanced-fiber-production-in-virginia/. Retrieved February 9, 2012. ^ "Ukrop’s to sell 25 stores for $140 million." December 17, 2009. Retrieved January 20, 2010. ^ "Six Years Later «". Save Richmond. July 19, 2009. http://saverichmond.com/?p=1965. Retrieved February 10, 2012. ^ Galbraith, Kate. "Do-It-Yourself Entertainment, Way Off Broadway." New York Times', December 10, 2006. Retrieved January 20, 2010. ^ Calos, Katherine. "No Barking at Barksdale." DiscoverRichmond.com, July 22, 2008. ^ McAuley, Muriel and Nancy Kilgore. Going On: Barksdale Theatre, The First Thirty-One Years. Taylor Publishling: Dallas, 1984. P. 91. ISBN 978-0-9613905-0-1. ^ "Top-ranked Graduate and First Professional Programs." U.S. News & World Report. March 31, 2006. Retrieved on February 22, 2007. ^ "Lewis Ginter Botanical Garden Factsheet" (PDF). http://www.lewisginter.org/about/documents/GardenFactsheetAugust2008.pdf. Retrieved November 1, 2011. ^ "Camp Richmond.". www.fredericksburg.com. June 11, 2012. http://fredericksburg.com/News/FLS/2012/062012/06112012/706390. Retrieved July 10, 2012. ^ "About Richmond Kickers.". USL Soccer. http://www.uslsoccer.com/teams/2012/22375.html#ABOUT. Retrieved July 10, 2012. ^ "Richmond Flying Squirrels.". Minor League Baseball. http://www.milb.com/index.jsp?sid=t3410. Retrieved July 10, 2012. ^ O'Connor, John (October 15, 2009). "Flying Squirrels picked as new baseball team name.". Richmond Times Dispatch. http://www2.timesdispatch.com/sports/2009/oct/15/flying_squirrels_picked_as_new_baseball_team_xml_n-ar-22754/. Retrieved July 10, 2012. ^ Ress, David; Martz, Michael (January 16, 2008). "Braves strike out... for new home in Ga.". Richmond Times Dispatch. ^ "Raiders chosen as name for Richmond's AIFA team.". Richmond Times Dispatch. August 5, 2009. http://www2.timesdispatch.com/sports/2009/aug/05/aifa05_20090804-215405-ar-35106/. Retrieved July 10, 2012. ^ Stott, John C. (2006). Hockey Night in Dixie.. Surrey, BC, Canada: Heritage House Publishing Company Ltd.. p. 209. ISBN 1-894974-21-2. http://books.google.com/books?id=kbHdDub5r6AC&pg=PA209&lpg=PA209&dq=richmond+renegades+1990&source=bl&ots=xd-iFhteJ2&sig=dgC9Qe24Z_PvZrsG6CV7ERc5YSM&hl=en&sa=X&ei=RFH8T8Ujo_bSAZ3c_fUG&ved=0CDEQ6AEwAA#v=onepage&q=richmond%20renegades%201990&f=false. ^ "Renegades shut down operations.". Richmond Times Dispatch. March 27, 2009. http://www2.timesdispatch.com/news/2009/mar/27/gadegat26_20090326-230004-ar-48194/. Retrieved July 10, 2012. ^ "Indoor football team moving into Ashe Center". Richmond Times-Dispatch. July 22, 2009. http://www2.timesdispatch.com/rtd/news/local/article/IFLGAT22_20090722-151201/281469/. Retrieved July 10, 2012. ^ "Richmond Revolution Not Returning in 2012.". Richmond Raiders Insider Blog.. October 27, 2011. http://www.richmondraidersinsider.com/2011/10/richmond-revolution-not-returning-in-2012/. Retrieved July 10, 2012. ^ "Richmond Places Third in Best Tennis Town.". United States Tennis Association. September 7, 2010. http://www.midatlantic.usta.com/richmond_places_3rd_in_best_tennis_town/. Retrieved July 10, 2012. ^ "Virginia is for Lovers and Richmond International Raceway team up for NASCAR Spring Cup Series Race.". Richmond International Raceway. http://www.rir.com/Articles/2012/04/CC400-Announcement.aspx. Retrieved July 10, 2012. ^ "Southside Speedway Track Facts.". Southside Speedway. http://southsidespeedway.com/aboutus.html. Retrieved July 10, 2012. ^ Netherland, Tom (February 2006). "Richmond Loves Racing.". Richmond Magazine. http://www.richmondmagazine.com/?articleID=418d39f6e212efeaa4d223d19cd7d643. Retrieved July 10, 2012. ^ Brockwell, Kent Jennings (September 4, 2006). "10 Questions: Sue Clements: Southside Speedway's co-owner/promoter.". richmond.com. http://southsidespeedway.com/sueclements2006.html. Retrieved July 10, 2012. ^ "XTERRA East Championship in Richmond.". richmond.com. June 7, 2012. http://www2.richmond.com/lifestyles/2012/jun/07/xterra-east-championship-richmond-ar-1969993/. Retrieved July 10, 2012. ^ Jones, Will (September 21, 2011). "Richmond picked to host World Road Cycling Championships". Richmond Times-Dispatch. http://www2.timesdispatch.com/news/news/2011/sep/20/19/mayor-heads-delegation-to-denmark-for-cycling-even-ar-1323747/. Retrieved September 21, 2011. ^ Holmes, Gary. "Local Television Market Universe Estimates." Nielsen Media Research. Retrieved on January 20, 2010. ^ Titles with locations including Richmond, Virginia, USA IMDB Retrieved on September 28, 2007. ^ "A Different World." IMDB. Retrieved on September 28, 2007. ^ "Hawthorne". tv.com. http://www.tv.com/hawthorne/show/76012/summary.html. Retrieved March 18, 2011. ^ "Richmond Public Schools Overview – At A Glance.". Richmond Public Schools. June 2008. http://www.richmond.k12.va.us/indexnew/sub/fastfacts.cfm. Retrieved October 2, 2009. ^ Hickey, Gordon (December 8, 2008). "Governor Kaine Congratulates Thomas Jefferson High School For Science And Technology ~ Fairfax County school again tops U.S. News & World Report's list of 100 best ~". Virginia Department of Education. http://www.doe.virginia.gov/news/news_releases/2008/dec08.shtml. Retrieved July 10, 2012. ^ "America’s Best High Schools 2012.". Newsweek. May 20, 2012. http://www.thedailybeast.com/newsweek/2012/05/20/america-s-best-high-schools.html. Retrieved July 10, 2012. ^ "Virginia's Public Charter Schools.". Virginia Department of Education. http://www.doe.virginia.gov/instruction/charter_schools/charter_schools.shtml. Retrieved July 10, 2012. ^ "Private Schools List.". Richmond Times Dispatch. January 27, 2008. http://www2.timesdispatch.com/special_section/2008/jan/27/private_schools_list-ar-138084/. Retrieved July 10, 2012. ^ Garbarek, Ben (November 16, 2010). "Megabus coming to Richmond with cheap fares – NBC12 News, Weather Sports, Traffic, and Programming Guide for Richmond, VA |". Nbc12.com. http://www.nbc12.com/Global/story.asp?S=13514197. Retrieved November 1, 2011. ^ "Comprehensive Operations Analysis Final Report". Greater Richmond Transit Company. March 3, 2008. http://www.ridegrtc.com/images/GRTC%20COA%20ExecSummary.pdf. Retrieved June 16, 2010. ^ "The History of Main Street Station (RMA)". Rmaonline.org. http://www.rmaonline.org/mainst/mainsthistory.html. Retrieved November 1, 2011. ^ Dominion Virginia Power Website. ^ Sister Cities information obtained from the Sister Cities International, Inc. (SCI)." Retrieved on February 22, 2006. Latimore, Carey H., IV, “A Step Closer to Slavery? Free African Americans, Industrialization, Social Control, and Residency in Richmond City, 1850–1860,” Slavery and Abolition 33 (March 2012), 119–37. City of Richmond at the Wayback Machine (archived August 10, 2001). This page uses content from the English language Wikipedia. The original content was at Richmond, Virginia. The list of authors can be seen in the page history. As with this Familypedia wiki, the content of Wikipedia is available under the Creative Commons License.